A newly updated study maps the continuing growth in global demand for higher education through 2040, and anticipates that by that point there will be nearly 600 million students enrolled in universities around the world. The analysis comes in the form of a new paper, Massification of Higher Education Revisited, from Angel Calderon, the principal advisor for planning and research at RMIT University in Melbourne. As the following chart illustrates, the total number of students in higher education is expected to reach nearly 380 million by 2030, 472 million by 2035, and more than 594 million by 2040 – all up from roughly 216 million as of 2016. As the preceding chart also reflects, the composition of that global enrolment by region is also shifting over time. And, in some important respects, these are very recent shifts. Up to 2002, for example, North America and Europe (together) enrolled more higher education students than any other world region. That changed in 2003 when East Asia took up the number one spot, driven in large part by the dramatic expansion of China’s higher education system. There were just under 44 million students enrolled in Chinese universities in 2016, compared to 20 million in the US – the historical global leader in terms of overall student numbers. In the intervening years between 2003 and 2016, East Asia has held that number one spot comfortably, while South & West Asia (as of 2014) also moved past North America & Europe to take up the number two position among world regions. As the following table reflects, Latin America has registered steady growth over this period as well and now sits as the fourth largest region for higher education enrolment. Much of the movement we observe here has been fuelled by underlying economic and populations trends. There were about 715 million people aged 18-23 globally as of 2015 – which we understand to be synonymous with “college age”. The UN projects that growth of this cohort will peak by 2030, after which it will continue to grow at a reduced rate. Even so, the global population of college-aged people is expected to reach 800 million by 2040. But an important related factor here is that that college cohort has been decreasing for some time as a percentage of total global population. 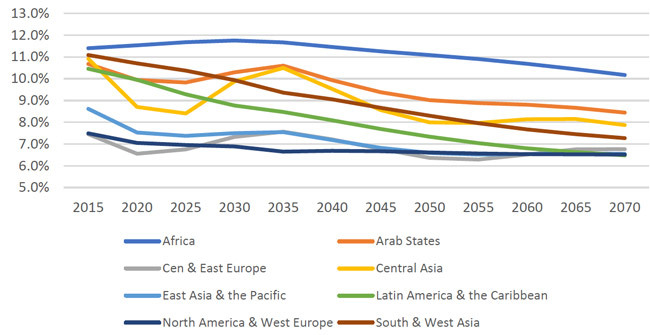 Those 18-to-23-year-olds will represent 9% of the world’s population in 2030, and 8.4% in 2040. There are many persistent roadblocks to continued growth in higher education enrolment in Africa, including funding, quality of programming, and institutional capacity. Even so, Mr Calderon’s analysis projects that total enrolment across the continent will roughly triple from 7.4 million students as of 2015 to nearly 22 million by 2040. This entry was posted in Asia, Australia/Oceania, Europe, Higher Education, Middle East, North America, Regions, Research, South & Central America and tagged postgraduate student recruitment, undergraduate student recruitment, student enrolment, student mobility, international students.